In my opinion there is only one reason to hide such information. 2 Vintage brass toilet door plaques. Lovely novelty toilet door plaques featuring boy peeing in potty and girl sittng on potty, ideal for pub toilets or cafe. Brass Scarecrow Ornament. Condition is used. Dispatched by Royal Mail 2nd Class. Weight 66g height 13cm. Age unknown. Shelf decoration or door stop. Will stand flat against wall or free stand. VINTAGE SOLID BRASS LEPRECHAUN, IT IS IN FANTASTIC CONDITION FOR AGE A GOOD COLLECTORS ITEM, IT IS A GOOD SOLID BRASS HEAVY ITEM. I THINK ITS A GOOSE AND NOT A SWAN OR OTHER LARGE BIRD. Antique Lincoln Imp Door Knocker. This is a brass Lincoln imp door knocker 95mm tall. Pair of matching brass lead shaped trays. brass and antique items from a house clearance. And a normal size jug. 3 pairs of miniature candle sticks holders. a letter holder. Candle Snuffer With Wooden Handle. Condition is Used. Dispatched with Royal Mail 2nd Class Large Letter. In good used condition with signs of use. 14 cm High. This is quite an old piece of brass in the shape of a beetle which opens. 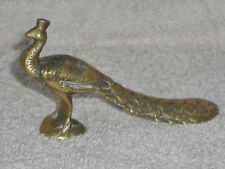 We have for sale our Decorative Brass Letter opener. Brass Mixed Lot Joblot Pig Hood Ornament Candle Sticks Not Scrap & Old Coins. Condition is Used. Dispatched with eBay delivery – Shutl 2-3 days. Perfect to hang your house of car keys on. Vintage Ornate Brass plate, picture stand. Ornate oval Vintage Art Nouveau Brass Freestanding Picture Frame.. Condition is Used. Excellent antique condition. Needs a little WD40 on the tabs that hold the glass in to move them and also needs the label residue on the stand removed.Have not polished as I like the current patina but if would polish up beautifully. Looks like original glass. Dispatched with Royal Mail 2nd Class. New listingLarge Vintage Embossed Brass, Copper and Wood Magazine / Newspaper rack. 4 Vintage solid Brass Mortar and pestels. Unusual shape . Boxed. This rickety old brass piece has a wooden base. The ploughman an fence are held on by screws that dont really match the brass - it is old and in need of TLC. Small Indian Brass Goblet H3.5”. Condition is Used. Dispatched with Royal Mail 2nd Class. 2 candle stick holders dog and cat. Lovely vintage brass galleried tray engraved with Indian design ? . Very good condition please see all my photos as they form a major part of my description . Happy to combine postage whenever I can . Please pay within 48 hours of auction ending & please no E cheques thank you Dispatched with Royal Mail 2nd Class. So 3 of each design showed. Three brass wall hanging birds. It is a mixed set (the 2 smaller ones are swallows and the large one is a duck).